Restored at a cost of over €13.3m, the whimsical Montebelo Vista Alegre Ílhavo Hotel is the latest salvo of the ambitious Terreiro da Vista Alegre – a complex that includes a clutch of national monuments, theatre, museum and retail boutiques. The hotel’s 82 rooms have been inserted into two distinct buildings that are joined by a black metal spiral staircase and a common wall of local red stone. The late 17th-century Palácio features ten gloriously restored rooms, one of which leads out to the balcony of the adjoining original chapel, whilst the newer rooms in the contemporary building – the best ones face the River Boco – provide an unexpectedly playful counter-note. 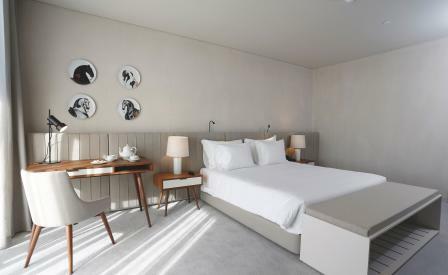 The latter is provided by the hotel’s creative consultants and designers Sam Baron and Isabel Abreu who worked closely with architects Paula Nunes and Tiago Araujo, and a team of local painters and potters to swathe entire walls and floors with porcelain bowls and saucers, and delicate hand-painted silhouettes of birds and butterflies. Meanwhile, the in-house restaurant cleaves close to Portuguese standards. Bacalhau, or salted cod, appears with a crunchy sausage crust and risotto, whilst eel stew, octopus with rice, and seafood stew round off a rather tasty prelude to a nightcap by the outdoor swimming pool with views of the Aveiro lagoon.